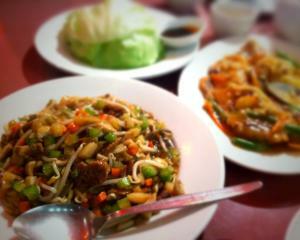 Mother Chu’s Vegetarian Restaurant – Pitt St, Sydney. This restaurant is a Sydney institution, it has been around for about 15 years, and is the place carnivores takes their visiting vegan friends because it is the one place they have heard of! Restaurant style: Sit down restaurant with table service, it isn't super fancy but if you get a window table there is lots of people watching. Recommendations: We had mixed entree (spring rolls, faux duck, fried wonton, fried tofu, fried tempeh and a pumpkin cake) to share ($6.80), sang choy bau and stir fried crispy soy roll and everything was delicious. Looking around everyone else's food looked amazing too.